Three words describe LEVIATHAN: Alien, Abyss, Thing. LEVIATHAN is their deformed lust-child. The word ‘leviathan’ is so cool, conjuring images of the biblical sea serpent or some demon as great as a whale, but in this movie, it’s just some kind of shapeshifting Alien-Abyss-Thingy. Exceptionally bad special effects and cheap rubber suits make it imperative the director shoot all the monster action as if he’s in the process of falling down a flight of stairs. The tragedy of this dreck is that its makers have such talent: director George P. Cosmatos directed the ridiculous-but-well-made RAMBO: FIRST BLOOD PART II (1985) and would go on to helm the stellar TOMBSTONE (1993), while writer David Webb Peoples penned BLADE RUNNER (1982) and LADYHAWKE (1985) prior to this poo-poo and would have one of his long-salting stories soon made into UNFORGIVEN (1992). 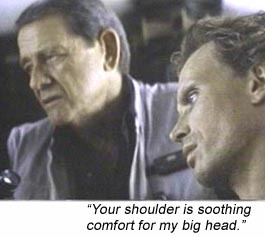 Peter Weller (as the captain) tries valiantly to save the crew from overacting, but Richard Crenna (as the doc) is there to counter all his efforts. The undersea cast includes Daniel Stern (What talent this guy doesn’t possess! ), Ernie Hudson (“Who you gonna call?”), Amanda Pays (the hot Brit chick), Hector Elizondo (uh, really? ), Lisa Elibacher (vapid blonde from BEVERLY HILLS COP)–not so much an authentic ragtag crew (as in ALIEN, THE ABYSS or THE THING) but a cast cobbled together from second- and third-choice actors after the preferred cast backed out slowly with smiles frozen on their faces trying not to make any sudden moves. Which is ironic because it’s what this cast ends up doing throughout the film anyway, whenever they see the Alien-Abyss-Thingy. Writers: David Webb Peoples, Jeb Stuart. Starring: Peter Weller, Richard Crenna, Daniel Stern, Amanda Pays, Ernie Hudson, Hector Ellizondo, Meg Foster, Lisa Elibacher.